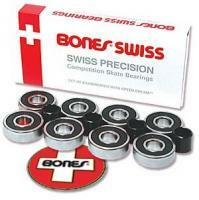 Original fast, smooth easy to clean Swiss bearings made for skates! Higest quality roller skate bearings. Fits 7mm axles only - Snyder, sure-grip, Roll-line plates.CLICK HERE FOR THE REGULAR SIZE CERAMICS Bones Swiss 7mm bearings fits only 7mm axles, which are not standard on all plates. Enough for 8 wheels - one pair of roller skates with 7mm axles. Qube Bearings Teal set of 16 - 7mm fit all 7mm axles (9/32"). Long lasting indoor and outdoor bearings.